The VT900-3 wireless video transmitter is available in three versions; the VT900-3A conforms to FCC Part 15 requirements for unlicensed use and has a range of approximately 300-400 feet*. VT900-3B has higher power output (90mW). It has a range of approximately 2600 ft.* Model VT900-3C has the highest power output (1 Watt) for longest range performance, up to 1.3 miles. * Because of their higher output power, models VT900-3B and VT900-3C may only be used for law enforcement or military applications (please consult Applied Wireless for ordering info regarding these higher power products). 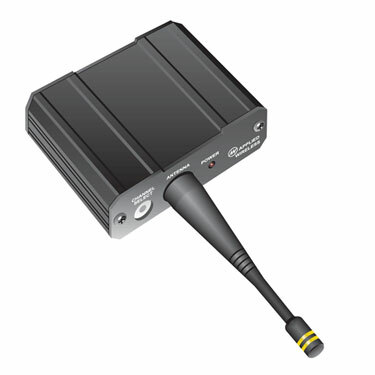 The VT900-3 wireless video transmitter provides excellent B/W and color video quality. The channels are spaced 8 MHz apart to allow multiple channel operation in an area. Use with VR900-3 wireless video receiver. For audio/video applications, see model AVT900-3. For longer range, use a directional receive antenna. * Line of sight, when used with VRT900-3 Receiver and included antennas. Much greater ranges available with a directional receiver antenna such as a yagi.